After nine years the Leduc Regional Chamber of Commerce Business Awards Gala has become an event that people throughout Leduc and area have come to anticipate with excitement every year. Each year it sells out well ahead of time with gentlemen shining their shoes and pressing their best suits and ladies donning gorgeous ball gowns with necks and ears dripping with jewels to attend this formal affair. The venue never fails to match the attendees opulence either, with entertainment in the foyer of the Executive Royal Inn encouraging people to enjoy a complimentary glass of champagne as they mix and mingle around the silent auction tables before entering the main ballroom. This year, in keeping with the Olympic theme of "Celebrating Champions" everyone entered the hotel down a red carpet lined with Leduc Boys and Girls Club members who were dressed in red and white and waved Canadian flags as they clapped and cheered the entry of all Gala attendees. At 7 pm the opening of the main ballroom doors was announced with an explosion of confetti over the crowd as they then walked under a fabric archway with the Olympic Rings suspended overhead. Once inside, the eyes were treated to a room decorated with a glory of glowing, tall glass table centers, each one featuring its own Olympic medal. The stage was also draped in layers of white fabric with huge fabric columns topped with ostrich feathers bordering each side of it, and another set of Olympic Rings hanging behind the podium. In testament to the growing profile of this event, the room held a number of dignitaries both local and otherwise that had made sure to attend the Gala. The Mayors and several Councillors from both the City and County of Leduc were in the audience, as well as MP James Rajotte, MLA George Rogers, MLA Naresh Bhardwaj, and Edmonton City Councillor Mike Nickel. As everyone found their seats the formal program got underway with Chamber Board Members Lee Plamondon and Andrew Canham fully enjoying their jobs as hosts for this years' event and repeatedly drawing laughter from the crowd with their funny and teasing banter. Their opening joke involved Andrew bragging about his bronze medal for "Best Looking Guy" to Lee, who congratulated him before informing Andrew that he had been awarded the silver medal in the same category. The joke culminated with MP James Rajotte getting up from his seat in the audience to trump the boys by showing off his gold medal as "Best Looking Guy". After the laughter died down Leduc City Councillor Beverly Beckett was called upon to say grace before dinner was served. Her lovely prayer ended with a call to remember the priorities in life as she quoted "We make a living by what we get but we make a life by what we give." Chef Gord Sandgren and his talented team truly outdid themselves this year with the five course dinner hitting exactly the right notes with every plate. It would be easy to wax poetic about each course but in an effort to give all aspects of the evening equal attention I think it is fair to mention just a couple of the truly outstanding portions of the meal. The "Traditional Doukhobor Borsch with Creme Fraiche" could not receive enough praise from everyone at our table. There was a twist in that it was a smooth, blended borscht but the spice mix, that did not overpower but instead completely complimented the beet based soup, was a culinary victory. The "Russian Style Beef Tenderloin" was cooked to perfection and extremely tender with the accompanying roasted vegetable ragu so rich and wonderful it made you want to ask for seconds. The topper to the meal was the beautifully presented trifle inspired layered dessert inside a hand made chocolate egg. The chocolate vodka soaked rye bread was a confectionary dream when combined with marscapone cheese and cherries then topped with edible gold leaf. The wines that were partnered with each dish worked very well with all the courses with one notable exception. While it is acknowledged it is hard to pair a wine with salad since it would be very easy to overpower greens, the Chardonnay chosen to accompany the salad course was so innocuous it could easily be called bland. But since everything else was of such consistently high quality it was easy to overlook this one small off key note in the symphony of the entire evening. In between each course the real reason for this glittering gathering was celebrated with the nominees being recognized in seven different categories of business excellence. In each of six different categories three individuals or businesses had been nominated by other Chamber members and were vying for top honours as various examples of excellence in service and business acumen within the Leduc region. The first award handed out for the evening was the much coveted "Peoples Choice For Customer Service Award". This particular award probably generates the most competition every year as the nominees are submitted and voted on by the public at large and it is a big feather in the cap of not only the award winner, but also for the business who employs such an outstanding example of customer service excellence. 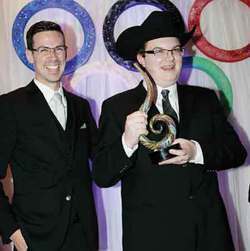 This years' award went to the popular Mr. Tyler Prazak who has been employed by Sobeys Leduc for several years and is a well known sparkling personality in the community. The Agricultural Business of the Year Award was won by Peak Swine Genetics, a company based in Nisku, and Small Business of the Year was awarded to Baynes Family Chiropractic who have been in Leduc for quite a few years now, with the entire family involved in not just growing their business but they are also active volunteers for many events and activities around Leduc. Megan Madden of Southpaw Communications Inc. was thrilled to be awarded the Young Business Leadership Award and local Twitter activity went crazy announcing her win. The entire audience exploded into applause as it was announced that 93.1 The One FM had won the Start Up Business of the Year and owner Mark Tamagi was beaming as he accepted the Award. Competition for the final award, Business of the Year, is always stiff with three well deserving nominees running neck and neck right up until the envelope is opened. This year Castrol Raceway walked away with top honours with Clarence Shields from Blackjacks Roadhouse accepting on behalf of Castrol since the owners could not be in attendance. The final award of the evening was the President's Choice Award, chosen by the Chamber President as a special award of merit for exceptional service within the community. This year's recipient was Graham Bromley and family formerly of Leduc Sobeys. Chamber President Cindy Guy read off a long grocery list (pun intended!) of well earned accolades about the Bromley family and the support they had given to this community over the 36 years they had been here, including donating an incredible $1.5 million dollars to numerous local causes and charities. On hand to accept the award on behalf of the family was Graham and Karen's daughter Susan and son in law Sean. Graham and Karen had prerecorded a thank you message that was projected onto a large screen for the everyone to view since they are now enjoying their retirement in Maui, which drew a huge sigh of envy from the crowd. After all the hardware was handed out to the deserving recipients a new twist was added to the end of the evening in the form of a live auction. Volunteer auctioneer County Councillor John Schonewille grabbed the microphone and proceeded to pry open wallets around the room to bid on three special donated items. The first to go was a basket of chocolates and the five wines served with dinner which sold for a generous $300.00. The next item up for grabs was an acrylic painting of two Canadian hockey players that had been created that night in the foyer where everyone could watch the artistic process, by artist Jeanine McIntosh. This work of art went to a very good home for the sum of $1000.00. The final auction item was donated by Blackjacks Roadhouse and was a trip for two to Las Vegas with a three night stay at Caesar's Palace and two tickets to see Shania Twain. David Stasiewich and his lovely wife will be packing their bags for a fabulous trip after he was the winning bidder at $2350.00. The evening drew to a close with nominees and award recipients all leaving feeling like winners after a fabulous evening of entertainment and excitement and already looking forward to next years Gala where the Leduc Chamber of Commerce is sure to outdo itself once again.